Just a thread to talk about this wonderful module, share patching tips, videos and audio. The Multi Delay Processor might be my favorite module I ever got... It is sooooo much more than a delay. I love it. It's just impossible not to tweak it in every way... and it sounds incredible all the time. some techno/ house minimal stuff with verbos CO and HO for bassline / melody. multi delay processor also doing some work. Feel free to add more and share ! I cracked and ordered from Perfect Circuit yesterday. Hopefully someone will take my Akemie's off my hands to ease the pain in my wallet! Cool to have this dedicated thread. Please do when you get it ! Yeah it's a great one and one of my favorite thing to do with the delay as well ! I wish I could spare the HP for it. I have a rainmaker already but have lusted over this delay. Anyone with both or who have used both at some point care to offer their thoughts on both modules? I have both and i love both. Completely justified for having both. They sound very different, they are very different in usage/patching, and they have very different end results. I absolutely love the sounds coming out of it in every demo and track I've heard so far. And the followers. That said, I'm puzzled by the lack of a clock input / tap tempo. There's a tension that hasn't been fully resolved yet between the very analog Verbos design ethos and the feature sets / options users expect from a digital module. Based on sound characteristics, I would choose this over Rainmaker; based on features and utility I'd choose the latter. Fortunately I already have a few great delay modules, so I'll be content listening to what other people come up with in this thread. damase has answered very well already but I also have both and use both all the time. They are very complimentary and each du stuff than the other isn't capable of. The Multi Delay Processor has more of a sound of its own, and has the great advantage of being very tactile; it's not a set and forget module, you play it. The pitchifting and reverb lead you to great washes of ambiance and are very useful for sound design. Like Mark Verbos says himself it's not an end of chain delay, it's a delay that's an integral part of your voice. I don't mind the lack of clock input really; I think it's good to have a delay that is not in perfect sync sometimes. And once again it's not like a tape delay with endless repeats, it's rather short delays that help you mangle/create a sound (which you can put through a classic delay afterwards). This video covers the relationship between the two modules and a fair bit more. It's rather interesting ! i had the rainmaker and currently own the verbos delay. 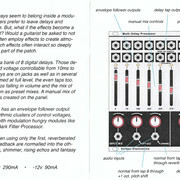 rainmaker on paper has more features but in practice i much preferred the sound and interface of the verbos delay. verbos interface is very inviting for tweaking and experimenting and the feedback possibilities are great. to me this module is very "modular" and interacts quite well with other modules in my system (random sources, filters, oscillators for fm etc.) while the rainmaker seems more like a box in itself, which there are better ones both in hardware and software imo. similar to my processing chain, but I use the a-188-2 instead of the verbos... this may change though. I love the weird stereo image you can get when you hard pan output1>L and output2>R, with varying degrees of tap amounts and mix amounts. is it fair to assume that doing the same with the odd/even outs on the verbos would produce a similar, if less noisy, result? As I understand it, the pitch shift and reverb inputs are for audio (interrupting the normal from tap 8) and not for CV, is that correct? If so, does patching audio there send it through just that effect and then into the feedback loop? So for instance you could take the output from tap 2 and 5 (or another voice) and send one through each effect? is it fair to assume that doing the same with the odd/even outs on the verbos would produce a similar, if less noisy, result? I'm not certain but I feel like the preset outputs take all the taps at full volume for Odd/Even and descending/ascending for the other. It makes for superb stereo image but it bypasses the faders. However the classic mono mix output is still available so you can mix and match; it do this sometimes to have the velocity of the taps and the stereo image. No, if you plug anything into inputs 2/3 it bypasses the FX. The pitch shift and reverb only work with the normalled taps. These are the cards that come with the delay, the "manual" if you wish. Thank you all for the replies! I'm glad to hear the comparison and that they both can compliment each other. It will eventually be nice to have both delays that do completely different things and used in extremely different ways. Ah, bless you! I've been wondering why I couldn't find heads or tails of the manual anywhere and had the same question about the extra audio inputs. Now that I fully understand the design, I have to say I'm disappointed. The narrow clock range and lack of clock input is one thing (and it seems that has to do with the original Buchla design). I understand this is not meant to replicate "vanilla" delay or reverb. But the total lack of modulation inputs apart from clock is frustrating. No depth modulation on the pitch or reverb, and only a manual mix *if* you're only using one input. No alternate signal configuration or feedback routes. That just doesn't make sense to me. 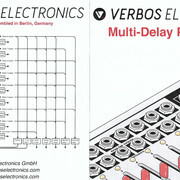 You have a big mixer for the taps but no way to automate or scan through them as you have in other Verbos modules. The envelope followers are a great idea, but you can do something similar with any other delay module and Maths (and in any case, self-patching is limited to using them on the clock). Mark has said he comes from the engineer's school of thinking, that delays and other effects should be added after the fact, and that this delay should be playable in a modular environment. I understand and appreciate the Verbos design philosophy, and I certainly wouldn't want him to break from it. But why make a digital module that is so limited in terms of how you can use it? The sound is fantastic from what I've heard, but without the ability to modulate and find new territory, there is a chance that it gets stale after a while. have to agree on the mixer section. i dont know why you cannot automate that like you can on the harmonic oscillator, bark and scan & pan...would have loved to have that feature. No alternate signal configuration or feedback routes. There are two feedback routes. The pitch shifter input and reverb input both allow for patching feedback. That just doesn't make sense to me. You have a big mixer for the taps but no way to automate or scan through them as you have in other Verbos modules. The taps are already scanned sequentially according to their placement in time relative to the input. You can speed-up or slow-down the scan rate with a CV. You have the ability with the sliders to mix their collective outputs any way you like. And, you can take individual outputs from any tap and run them through the sequential switch on the Verbos Sequence Selector if you want more variation. But why make a digital module that is so limited in terms of how you can use it? The sound is fantastic from what I've heard, but without the ability to modulate and find new territory, there is a chance that it gets stale after a while. It is a time-based processor, not a pitch-based or frequency-based processor. From a time-based perspective it offers a wealth of modulation possibilities. I think the design of the Multi-Delay Processor assumes that you are using it in the context of a fuller system with the expectation that you have some support and utility modules to help make the most of it.